Intellectual development is about building considering and common sense abilities. To be able to keep in mind individuals, names, locations, songs, rhymes and so on. To be able to organize, categorize, calculate and concentrate. Using details to be able to hypothesize, resolve challenges and find out new methods for doing things are all important cognitive skills that lead to scientific, mathematical and linguistic concepts later. Materials such as bambinoLUK can help to develop cognitive skills. Playing and learning are the main design principles behind the LUK learning system. It is well known that children learn best when having fun. Playing is the way children learn, especially for the younger ones. If they play with challenging, interesting, well designed and age appropriate contents, they learn and benefit more. This is because their brains are stimulated, enriched, allowing them to achieve higher level thinking skills. 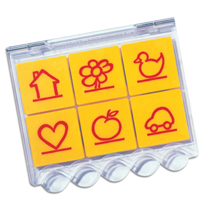 Using the required controller tiles as they play with the system, children develop fine motor skills as well as strengthen their eye hand coordination. The contents of the system focus on the intellectual development elements of memory, concentration, visual perception, logical thinking, linguistic and mathematical skills. These elements also serve as the foundations not only for learning to read, write, and do math, but also for continued lifelong learning. Hi, my name is Lisa and I just want to say how impressed I’ve been with the Luk learning system. I’d bought it for my son wanted a toy that wasn’t noisy and that he’d maybe learn something from; and if I’m honest I wasn’t expecting much. However I have to say I’m amazed at the difference between him and other children his age; even the other adults at his playgroup have commented on it. His memorization, concentration and motor skills are quite superior to the other kids his age and his visual perception and logical thinking have also improved since he started playing with it. He really enjoys playing with it as well and I think it’s the bright colours that make it so attractive. Best of all with its self checking design I can just leave him to play and learn. Thank so much BambinoLUK for a great toy.